Pudding is such a comfort food. Whether you like it warm or chilled, it is a favourite of all ages. 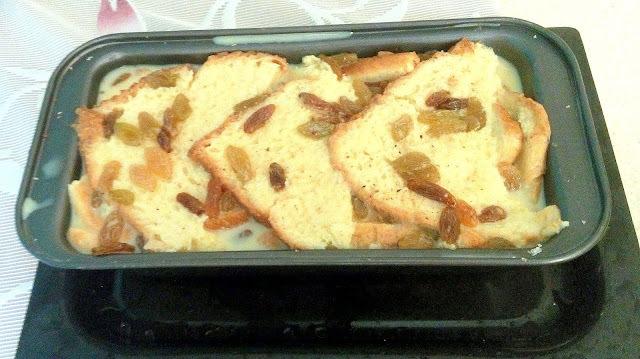 Made with simple ingredients that are already lying in my kitchen, I present my version of a Bread and Butter Pudding that is studded with Raisins. Butter all the bread slices generously. Cut the buttered bread slices in triangles. Place all the bread triangles in a row and make layers of it. Inbetween the layers spread a few raisins. Whisk together eggs, milk, sugar, vanilla essence and nutmeg powder. Don't be afraid of nutmeg spice. 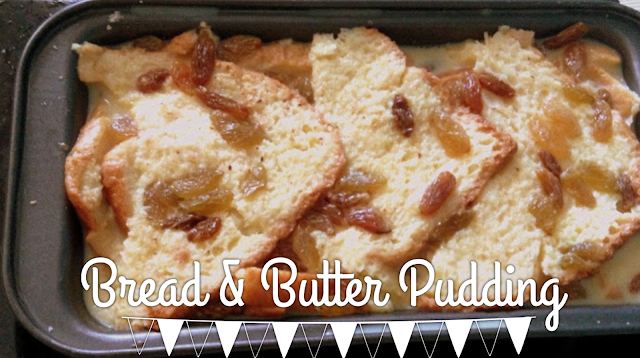 It adds an interesting taste to the otherwise mundane vanilla flavour desserts. Spread a few raisins on top of the pudding as well. Pour the milk mixture on top of the bread and let it soak before cooking. Place the pudding mould in fridge for atleast half an hour. This way all layers of bread will have time to absorb the milk mixture. Bake in oven for 30-45 minutes at 180 degrees Celsius. Steam the pudding on a gas stove. Microwave the pudding in a heat safe silicon pudding mould for 7-8 minutes or till the pudding mixture is not runny and milk is dried. The pudding will be not as dry as a cake. If you insert a toothpick, it will have some moisture which is a good sign. If you fancy a more softer pudding, then increase the quantity of milk. This will give you a thick milky sauce along with a soft pudding. If you want a more cake like pudding which is set, dry and you can cut clean slices then add a total of 3 eggs and reduced the quantity of milk. I have not trimmed the edges of the bread. After cooking the edges are as soft and tasty as the center itself. If you dislike it, then you can trim it. You also have the option of using a mixer-grinder and making a smooth paste of bread-eggs-milk-sugar. This way your pudding will resemble more like a soft moist cake. Instead of nutmeg you can also use cinnamon powder.